As we featured yesterday the new Nvidia Geforce GTX 680 officially arrived in stores yesterday ready for an eager public to get there hands on these super fast pimped up graphics cards. Well Dutch website Hardware.info did better than just purchasing one of the $500 cards, and was able to acquire four of the monsters to test in Quad-SLI. Posting the results for all to see on their website. Watch the video after the jump to see Geforce GTX 680 Quad-SLI in action. 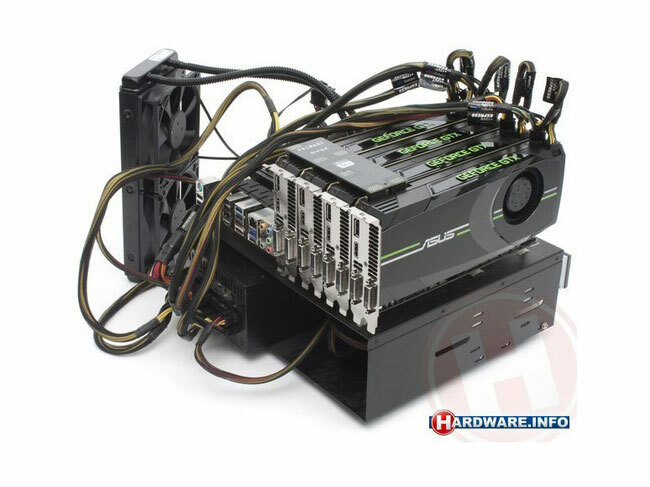 To recap the Nvidia Geforce GTX 680 graphics cards are equipped with 2 GB GDDR5 RAM, 1006 MHz base clock, 1058 MHz boost clock, 1502 MHz memory clock freqency, 2x DVI, 1x HDMI and 1x DisplayPort 1.2. You can check out the full test and results over on the Hardware.info website.